Whispers in the Loggia: "Among Us Is the New Pope... To Whom I Pledge My Obedience"
Much as a final scripted message wasn't foreseen, the 265th Roman pontiff's rationale to give a last talk before becoming "Pope-emeritus" became clear at the message's end, as Benedict XVI told the group charged with electing his successor that, "even today," he pledged "my unconditional reverence and obedience" to the next holder of Peter's chair – the first to have a living predecessor since the 15th century. As previously noted, Benedict will depart the Vatican by chopper just before 5pm Rome time, and is expected to greet those on hand at Castel Gandolfo from the villa's balcony shortly after his arrival. Around three hours later, at 8pm, the Swiss Guard detail guarding Benedict there will leave, marking the sede vacante and the lack of a Pope. At the same time, in keeping with centuries of tradition, the papal apartment will be sealed until the next pontiff takes possession of it. 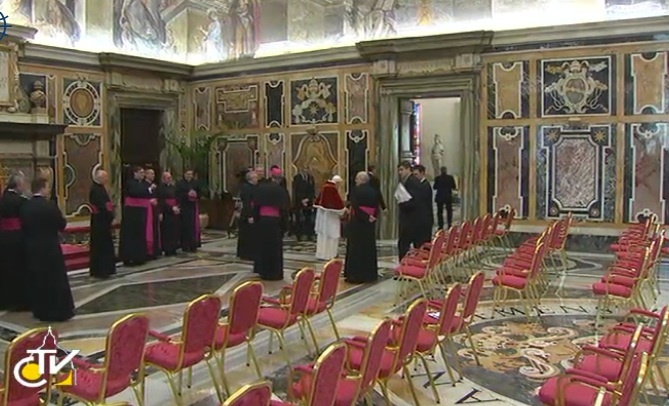 Beyond the red hats, roughly a score of other key Vatican aides were on hand for this morning's last goodbye. 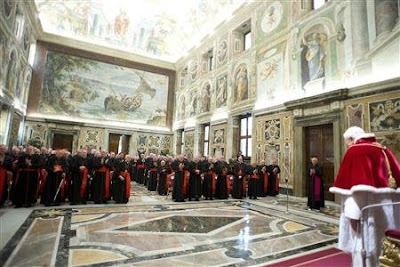 Almost all the others having left the room after making their individual farewells to Benedict, only a handful of monsignori remained as – for one last time in his "home" of the last eight years – the Pope was given the cane he's used sporadically over the last year, and quietly shuffled away from sight.